There are different types of bird feeders for almost every type of bird that visits your backyard. 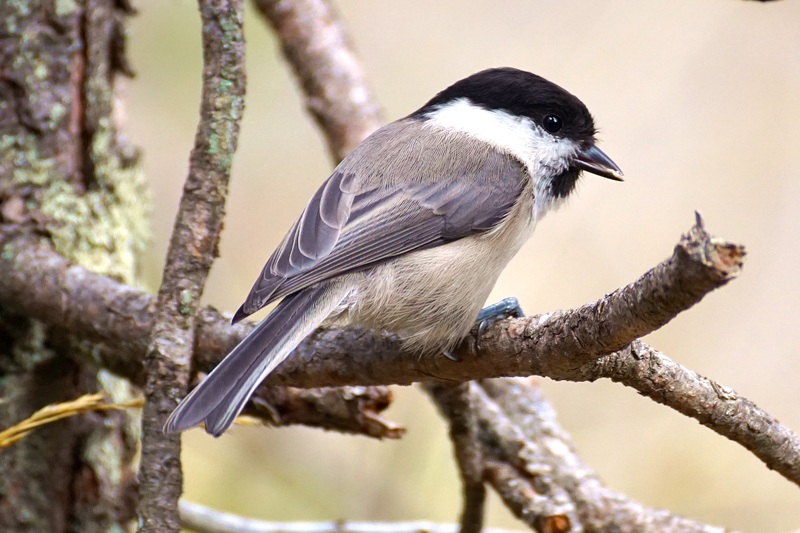 It depends on the bird’s feeding behavior, the type of food that the bird eats, and the size of the bird which will determine what feeders it will use. Some feeders attract more of one type of bird than another. Feeders also differ in terms of maintenance requirements so when making your selection, consider how easy a feeder will be to clean and refill and how often refilling will be required. 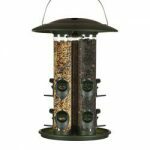 Types of feeders include ground feeders, nectar feeders, platform or tray feeders, tube, hopper, suet feeders and window feeders. Your choice will depend on the types of birds you want to attract. Check out the types of feeders below and decide which one/s will work for you. As you can see from the photo to the left the feeder sits on the ground for easy access to any type of bird or mammal. For this type of feeder you put in seeds, nuts, and insects. Doves, juncos, jays, sparrows, towhees, goldfinches, and cardinals will use this type of feeder. However, so will squirrels, raccoons, deer, skunks, and ducks like it too. A lot of people like to use this type of feeder because it keeps a more tidy appearance and keeps the seed off of the ground. If you do not mind all of the critters coming in too then this one is for you. Platform feeders come in different forms. There are some that can hang from trees or hooks either high or low. Some platform or tray feeders have a roof on them and some do not. It depends on your preference. This type of feeder has a screen like bottom which makes the rain flow through it and not settle inside. Personally, I use the type as seen in the photo because you can put any type of seed or other wild bird food like oranges, oranges, grapes or even suet. 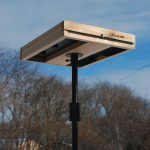 This type of feeder draws in many, many different types of birds including red tailed hawks and cooper’s hawks. The hawks of course are going for the other birds which is part of their diet. 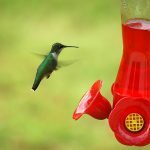 Nectar Feeders are used for hummingbirds. They hold liquid, which is a nectar substitute from the flowers that hummingbirds like. The feeders often come in bright colors which help attract the birds to the feeder. There are many different varieties anywhere from very small ones with suction cups for windows, to larger ones to hang on hooks. You will sometimes see woodpeckers, finches, and chickadees on these feeders especially during the hot summer when there is no water source nearby. Hoppe r Feeders are usually enclosed and covered so they tend to protect the seeds from the elements which can make them spoil easier. 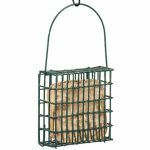 Birds that use this type of feeder are doves, jays, cardinals, woodpeckers, nuthatches, chickadees, finches, and many other birds. You can adjust it to a pole or hang in a tree. With this type you can either use one type of seed such as sunflower seed or a mix with nuts and fruits to get more songbirds and woodpeckers. 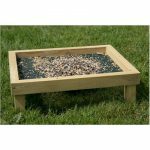 Seeds drop down onto the tray gradually and larger birds are able to land on it. Hopper feeders should be completely emptied and cleaned at least once a month. They are a bit harder to clean than platform feeders. Tube feeders are hanging-type feeders that allow birds to feed through screens or ports. They keep the seed fairly protected from the elements. They have small perches that the birds can rest on. The main advantage of this type of feeder is that the larger birds such as blue jays do not have an easy time getting to the seed so there is no competition for the smaller birds. While tube feeders may be somewhat squirrel proof, if they are ambitious enough they will chew right through a cheaply made feeder. The best type to get is one with metal ports around the seed dispensers to protect the feeder from the squirrels. There are some types of tube feeders designed for the birds that can feed upside down such as the goldfinches. Birds attracted to this type of feeder are goldfinches, house finches, chickadees, pine siskins, and redpolls. The type of seed that you use is generally a regular mix or sunflower oilers or seeds. Nyjer seed is a tiny, black oilseed which is grown in Africa and Asia and imported to the United States to use for bird seed. It is also know as thistle. Nyjer feeders are often tube-shaped and specially designed with tiny feeding holes to allow access only to small-beaked birds such as finches. Another type of nyjer feeder looks like a hanging mesh bag which birds cling to while they feed. However, the mesh type bag can get very wet after a rain and should then be refilled. Birds that use this type of feeder are goldfinches, house finches, redpolls, and pine siskins. Suet is a type of high fat and protein that usually contains peanut butter or a rendered fat which is mixed with grains, seeds, or fruits and nuts. You can either purchase the suet cakes or make your own mix and put on a pie plate, in a wreath form, or you can purchase suet feeders at your local bird supply store. A simple recipe that we use is to mix peanut butter with sunflower seed, shape it to the form you are using, then place it in the freezer until it forms a solid . Suet can spoil in the hot sun so you need to keep an eye on it. While it attracts many different types of woodpeckers, blue jays, wrens, chickadees, cardinals, titmice, bluebirds, nuthatches, and other songbirds, it also can attract the less desirable starlings which will clean the feeder out in a matter of an hour. So keep that in mind if you tend to get a lot of those birds in your yard. Window feeders generally are small plastic boxes or platforms that you can attach to your window with suction cups or a hook to the window sill. They best thing about these types of feeders is that you get to see the birds up close and personal. Additionally, squirrels have a hard time getting to them and that is a plus. In this type of feeder you can put pretty much the same thing as the platform feeder. The bigger birds that go to the platform feeder will not be able to get on the window feeder. Birds that come to window feeders are finches, chickadees, titmice, different types of sparrows, and rose breasted grosbeaks have come in to our window feeder too. 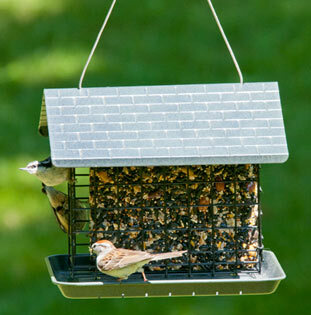 There are many different types of feeders that you can place in your yard to attract the birds. 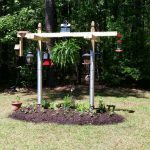 It all comes down to what types of birds you want to attract to your yard, where you intend to place the feeders, and what type of wild bird food you are going to use. I guarantee that if you have bird feeders in your backyard, you will truly enjoy watching all of the beautiful birds that come in and feed. It is a fun and entertaining time. If you have any comments please feel free to do so below. I would love to hear from you. 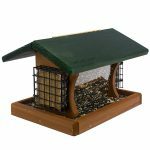 Posted in Backyard Birds, Landscaping For Birds, Wild Bird Food.